This week, we picked up several beautiful picture books from the library. The first is one I picked up after story time at the library on Thursday. It's called Book! Book! Book! by Deborah Bruss, and it was a great selection for National Library Week. You can click on the title to see my full review of that one. Last week, Nicole at Tired, Need Sleep mentioned Jim Arnosky, so I wrote down his name and looked in his section at the library. When I saw Babies in the Bayou , I knew I had to choose that one. M is crazy about the movie The Princess and the Frog, in which the characters spend a lot of time in the bayou. And she loves babies, so it was perfect. The story is about the baby alligators, raccoons, turtles and ducks in the bayou. It's quite real in that he speaks of the mother duck keeping her babies safe from the alligators, and he shows the raccoons eating turtle eggs. But it's still a beautifully illustrated story of mommies and babies in the bayou. M seems to like it. Last week, Mrs. B. at Transformations mentioned Planting a Rainbow by Lois Ehlert. I know I've seen this one on other blogs as well, so I picked it up when I saw it on the Spring theme shelf at the library. M loves this book. I think it's her favorite picture book this week. The story is about a child and mother planting all sorts of flowers. They start by planting bulbs, then getting seedlings, then planting seeds ~ and then they watch their flowers grow into a beautiful rainbow. The second half of the book shows the flowers that fall into each of the colors of the rainbow. All of the flowers are labeled, so it would be a wonderful way to show your children the different types of flowers as well. I didn't get into this with M, and haven't read this book with C yet. The last book we picked up is one we just saw on the shelves and had to have. It's called Potato Joe by Keith Baker, and it's really cute. It's actually a counting book with some cute extras. For example, it starts: "One potato, two potato, Hello Joe, three potato, four potato, tic-tac-toe!" In addition to counting, the potatoes encounter other fruits, a few animals (M loves finding the tiny ant on some of the pages) and even some snow and wind. The last few pages are counting backward from ten until they end up back in the ground where potatoes grow. If you're looking for a fun counting book ~ or even just a cute new picture book ~ check it out! That's all for now! What have you been reading with your kids lately? 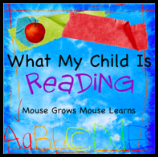 Hop over to Mouse Grows, Mouse Learns and share! The second book sounds like a winner. I will have to look for it. We read Potato Joe last fall and M loved it, lol. He helped dig potatoes in our garden and called them all Joe and Moe, etc. :) I haven't seen that Arnosky book... it sounds nice. I should tell you not all of his books are quite so "real" when it comes to talking about eating turtle eggs, etc. (Yikes!). I LOVE the sound of the second one, I'm off to see if I can find it on our library website! I love Jim Arnosky, if any of his other books become available, get them. They're awesome! Great picks, Julie, and thanks for joining WMCIR. I wanted to reread Ehlert book with Anna, but it's checked out at the moment. And I have to look for Arnosky book.